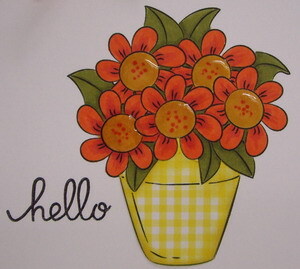 I colored the flowers with copics and paper pieced the pot with yellow gingham designer paper ... I'm a little obsessed with yellow gingham lately. :) I covered the flower centers with Crystal Effects to give shine and dimension. I just love the new line up of challenges and hope that you'll join us for some fun (and prizes!!). I love the shiny centers of these pretty flowers! 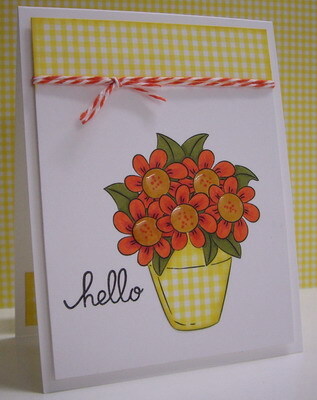 And the yellow gingham paper adds such a cozy feel to the card! Your lovely pot of flowers is making me yearn for summer and the pots I have on my patio - still aways away! Love the way you paper pieced the pot. Beautiful card Loll! :) I especially like how you've shaded you gingham paper, it makes the pot look really realistic. The shiny flower centers look amazing too. A much needed injection of Spring Loll into something that still feels like Winter! Suc a cute image; love the gingham and the Crystal Effects in the centre of the flowers. Simply delightful, at first I thought the flower centers were buttons, so dimensional and shiny. Yellow gingham is a happy spring -y pattern. Love it! Lovely spring like card Loll and the gingham is so fresh! Oh how sweet is this. Cannot believe how simple things are the nicest. Love that gingham pot and paper. And the flower centres are so 3D. Lovely spring card, Loll. I like how the twine defines the top border. Love all the bright colours, Loll! Beautiful colouring and paper piercing and the glossy accents. Beautiful card Loll. Lovely country colours. Have a great weekend. I love a bit of yellow gingham too Loll and love the bright flowers you've teamed with it! You are cheering me up no end with all of your pretty spring time cards, love this beauty.